Winter had finally arrived. After months of mild, wet weather with the feeling of October rather than December, things had finally turned cold, crisp and frosty. It was still pitch black, the rather dim light of the head torch swept the bramble hedges and grassy banks, the frost glittering briefly in the torches beam. The grass beneath brand new Christmas wellies crunched, the ice breaking at the edges of puddles. The sky above was clear, stars sparkled in the inky black, while a hint of orange glowed on the horizon hinting at the lights of the nearby city. Slowly the inky black began changing through shades of deepest blue, cancelling out the orange glow, as dawn began to break. With enough light now to see, we walk the frozen grassy and muddy tracks between raised banks beyond which the ground dips into pools. 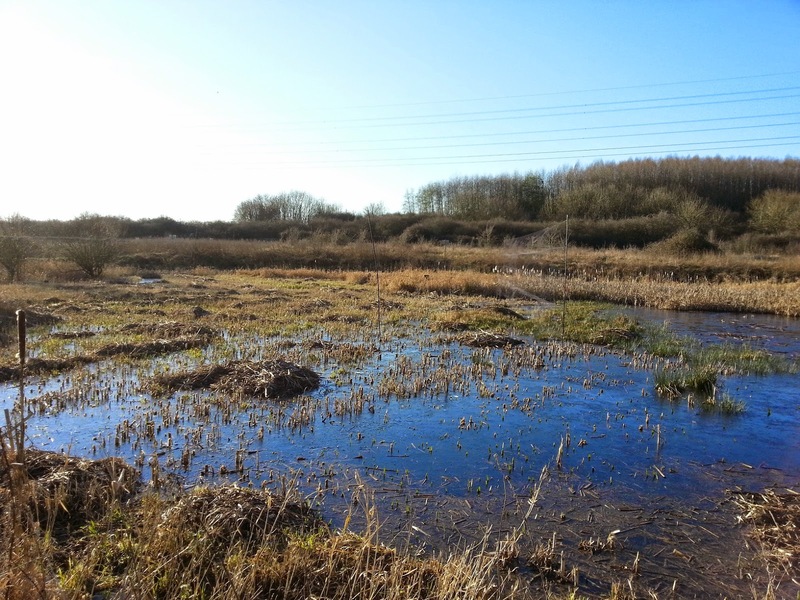 The reeds and grass within which have been strimmed, maintained and managed for birds. Stretching across two such pools is a series of strategically placed nets. We climb the bank and look out over the pools, we walk down the slope and step down into the frozen water. It is not deep, the ice cracks as we slowly walk across, skirting piles of reed and grass, purposely left for birds to roost on just above the waters surface. Reaching the first set of nets we find they have done their job well! As we approach the second set, which skirts a slightly deeper pool, walking through taller, dried grass that rustles as we pass, we flush more birds. They rise up out of the long grass, calling as they dash zig zagging away; only some of them encounter the nets. Our catch increases and is a good one; the birds are small mottled brown above, with pale, buff stripes down the back and on the head, a straight long bill and comparatively big dark eyes. They are Common Snipe. But some are smaller still, with a shorter bill. Those are Jack Snipe! In total there seven Jack Snipe and 12 Common Snipe, a cracking total even when you were aiming to catch them! But it just goes to show what maintaining and creating habitat specifically for such species can do. Both are listed as Amber due to declines in numbers. Common Snipe breed and winter in the UK and numbers have dropped especially in lowland wet grassland. Jack Snipe winter in the UK, but are a Species of European Concern. 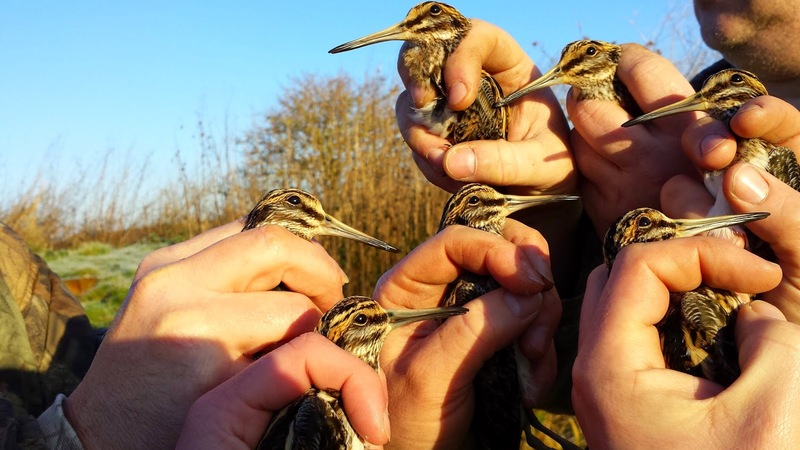 To have even seven Jack Snipe on site means it is Nationally Important. Beyond the tall trees at the edge of the site the brilliant golden sun breaks the horizon, casting its yellow rays across the glittering greens, browns and dun yellows of the pools. 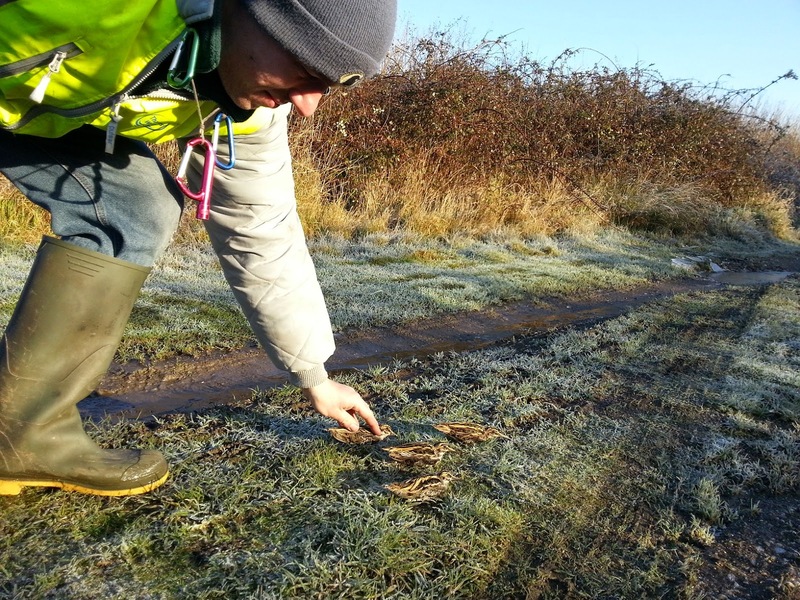 In the beautiful winter sunlight we ring and process, learning about these wonderful, cryptic waders. It is brilliant to be able to compare both species at the same time. 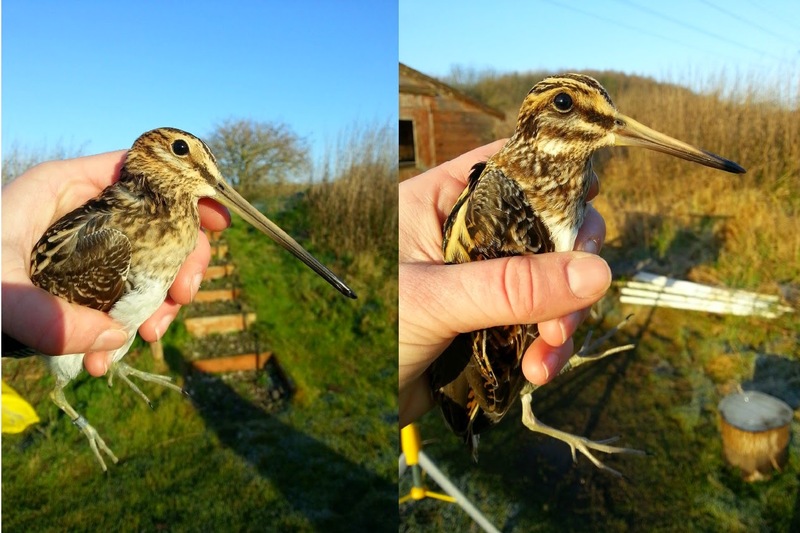 When complete we release each one, the Common Snipe zoom off quickly, not hanging around. The Jack Snipe however tends to rely more on its camouflage, crouching down until the last moment, flying low and then dropping down again. So when set down carefully after processing, for a moment that is where they stay. A huge thank you to Matt Prior and Graham Deacon of North Wiltshire Ringing Group for taking us out and letting us join them. Why not check out their blog to see what they are up to ringing wise.